3 Sports TV sports and cricket TV channel started free to air on Afghansat (Eutelsat 48D) at 48E in KU band. This is good satellite TV info for cricket and sports TV channel lovers that 3 sports which was previously available only on yamal 49E in C abnd but now 3 sports is added on Eutelsat 48D now called Afghansat (a TV satellite for Afganistan). Not only 3 sports but many new TV channels have added on Afghansat. The new TV channels are 3 sports, Shamshad TV, Zhwandoon TV, Negaah TV, 1 TV AFG, BBC persia, RTAm France 24 English, Ariana TV and Mitra TV. We can also hope of much more on this new Afghan Satellite TV. 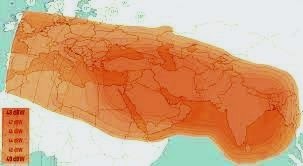 Here is the footprint coverage map of Afghansat (Eutelsat 48D), from here you can check whether you can receive afghansat or not. So give it a try and enjoy the free to air cricket and other sports on 3 sports TV. If you face any any problem in receiving Afghansat, just ask us in comments and we will be glad to help you. Hi, Manoj. Yes, you can catch 3 sports in Aurangabad Maharashtra as Afghan sat has good satellite coverage map in India. Can i use 2feet dish to view in west bengal?